is there a way to set an custom resolution? I'm planning on making a game with a low resolution. VS offers plenty of options, but many of them aren't in the 16:9 aspect ratio. It would be nice to have a resolution like 640 x 360 so it can fill the whole screen on mondern monitors, without black bars or stretching. Also I noticed that the highest possible resolution is 3480 x 2160, which seems like a typo as full 4k is 3840 x 2160. If this is not intentional i guess that's a typo. 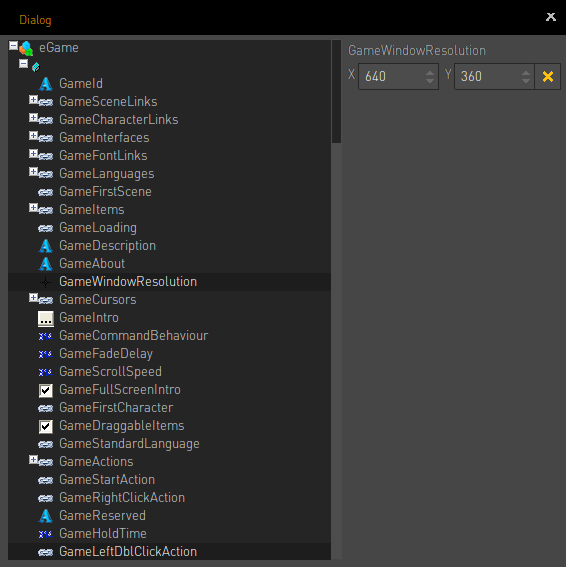 open the explorer in VS with ctrl+e / cmd + e and open the eGame tree. Scroll down to the GameWindowResolution field and click it. Then change the X and Y fields to your resolution. notice that when you enter a custom resolution, the resolution dropdown in the game settings page become "---". Changing it, would overwrite the setting again. To be honest I don't recommend trying to make a 4K 2D point & click adventure game. 1080p is demanding enough. 2D games in general can be quite resource intensive depending on the canvas size of your scenes/images/backgrounds, the amount of images/animations you have displayed, & how many frames your animations have - also the image format plays a part in how fast the animations load as some have better compression than others - I guess 4K would probably be ok for myst-like games/visual novels, as they often seem to be mostly made up of static images with little to no animations. I don't actually plan to use 4k. I was just noticing it (what I think is an typo) while looking at the available options in the dropdown.